If it doesn’t already exist, there is a dissertation to be written about modernism and the sleeve design for Smell the Glove. If you haven’t seen This is Spinal Tap in a while, the album the hapless metal band have been working on over the course of the mockumentary has its original cover art rejected and replaced with an all-black sleeve. The subsequent discussion of its meaning provides as good a game plan as any for dealing with the similarly all-black works in Nelson Henricks’ current exhibition at Paul Petro. Better known for his video installations, the Montreal-based artist has shifted media and found inspiration in a much older comedic riff on the monochrome field. Lawrence Sterne’s 18th Century proto-experimental mock-autobiography Tristram Shandy includes an all-black rectangle that obliterates an entire page of text at the moment of a character’s death. Henricks’s exhibition title Lacuna (Alas Poor Yorick!) 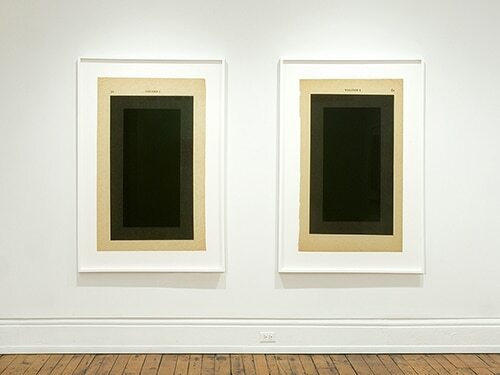 names the dead man and references the loss implied by the literary term lacuna (as well as its architectural meaning), while the photographs in the gallery replicate and repeat the black page from various editions of the book. Two hundred years later, Spinal Tap’s singer David St. Hubbins’ response to Smell the Glove is to say it looks like death – and not in a good way. The void evoked by the black quadrilateral can be considered representational in a number of ways: an open grave, the darkest night, charred wood. 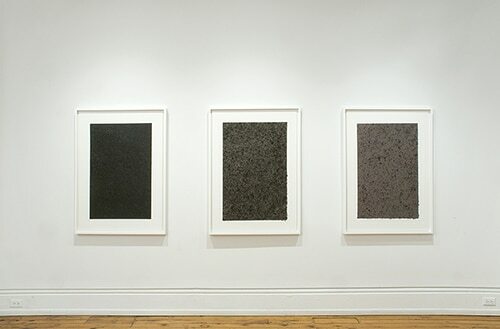 Henricks burned copies of Sterne’s book and used the ashes to create a series of eleven paintings that shift from grey to black like the dying light of dusk. Despite the humour in the book and the potential ridicule in beating a dead horse (Kazimir Malevich painted a black square in 1915), the reflections on mortality, particularly in the darkest of the photographs of the blackened pages, is inescapably elegiac. Guitarist Nigel Tufnel sees aesthetic purity in the LP sleeve and responds with the rhetorical question “How much more black could this be?” before he provides his own answer: “None more black.” It’s here that the aspirations of modernist teleology are upheld and undercut. Henrick’s knows his history, but rather than start with Malevich, he appeals to Sterne’s aberrational text to get it both ways. The black square is a statement of bravado but also inevitable failure. Even the nanotech innovations of Vantablack fall short of the promise of Tufnel’s absolute. Finally, bassist Derek Smalls sees the sleeve as a black mirror, which introduces the inevitable problem of glossy black surfaces in a well-lit white cube. The flat grey and black paintings aren’t affected, but any of the works under glass become reflective surfaces that turn the viewer’s vision back on itself. Just like the void, the mirror invites contemplation. And just like the black-clad existentialist mope, the colour selection is as much a costume as it is a philosophical truth. A refreshing complement to Henricks’ monochromes can be found upstairs with a selection of American artist Ross Bleckner’s paintings and etchings of flowers and plants. They too present potentially clichéd subjects that manage to wrest themselves from the formulaic by disappearing into dark black backgrounds or reducing the patterns of nature to simple lines and shapes. There is less emphasis on the immensity of oblivion here, but you’d probably prefer to have these hang on your wall. Nelson Henricks: Lacuna (Alas Poor Yorick!) continues until March 23. Ross Bleckner: Remediation continues until March 23.